In a strange and surprising news appearance, Argos UK has put up a listing for an “Elite Vulcan”. More info, a product description, and my speculations can be found below. Thanks to Reddit for the link. According to the above image, it features a new paintjob similar the White Rough Cut, and the White Stryfe. Mr. K of the Adult Fans of Nerf has also recently posted in the Reddit thread saying “Wtf, they literally told us they were not going to make an elite Vulcan”. Strangeness all around. I’m not doubting the legitimacy of this listing or item though. But what’s also odd to me is that Elite Darts are picture in the photo above, but Whistler Darts are mentioned instead of the product description. Could this blaster just be a repaint in a similar vein to the “Elite Jolt”? Whatever the case, I’ll keep you all updated with info as we get it regarding the blaster. Product description can be found below. Complete your N-Strike arsenal and prepare for the ultimate battery powered blasting! 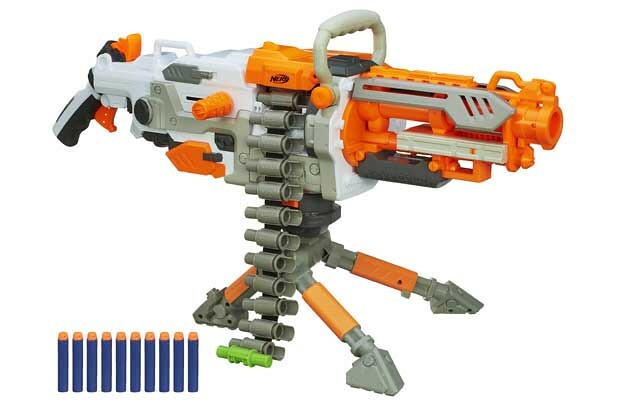 Massive and thrilling fully automatic blaster holds up to 25 darts and can fire up to 3 darts per second. Includes ammo box, removable tripod, 25 dart belt, 25 whistler darts and instructions. Previous PostElite Suction Darts, Zombiestrike Target Set, White Rough Cut Web Listings Make Them Available For SaleNext PostDo You Miss Urban Taggers? Don’t Expect A Comeback. I wanted it in blue, I aslo imagined a Vulcan successor with a better battery efficiency and faster rof, like the evolution of the rapidstrike from the stampede. Well, there are many more differences between the Stampede and the Rapidstrike then there will probably be between the Havoc and the Elite Havoc. The flywheel-system for instance. I think this maybe another elite barrel break, no improvements just a recolor and elite darts. Also the website isn’t great with product descriptions. http://www.argos.co.uk/m/static/Product/partNumber/3879317/Trail/searchtext%3ENERF+VULCAN.htm is the normal vulcan and it says it comes with a drum mag and 35 darts which is clearly the raider. I don’t know, the thing only has about the same if not less fire rate than the rapid strike. Fishy to say the least. However, I felt the same way about the Rayven Stinger, and it was real. If I was Nerf I’d release a blue-and-white version first before this repaint – although the repaint looks super cool. I’d also use C batteries, not D’s to reduce the weight. On the other hand, if this was Elite, it would set a record as the first Elite blaster to use a motorized direct plunger, which modders would love. I still smell a rat though. Those Elite darts don’t look right in there, and there’s not 25. I think its using the Elite Suction darts. I really hope they improved it. I just realized the belt looks strange. It looks like the cut away some plastic. I have a handful of last-gen belts, and they’re all like that; something about ease of loading and unloading and visual checking or some such. Has anyone considered that perhaps Nerf is a business wanting to make money? They probably have a ton of shells that they want to get rid of. All it takes is some marginal improvements (slightly better wiring in this case), paint it blue or white, call it Elite, then watch the money roll in on dead stock. There’s one thing that makes me think this is more than just a repaint: The price. I doubt that the new darts are the only reason for it. Was there really such a price difference between the normal Barrel Break and the Elite Barrel Break? Originally no but TRU jacked up the original Barrel Break to $27.99 while keeping the “Elite” version at $24.99 I’d like to see this new Vulcan state-side regardless of its Elite status – I just like the Vulcan and I’d be willing to mod a new one b/c if I screw it up I can easily get a replacement.